Bought a package of 6 private lessons? Once purchased, the management has put in a credit in your account equal to 6 Pay as You Go Private Lessons to book at any time. Book your classes by clicking here and click the “register” link next to any of the available classes. Select “I am already a customer”, put in your password and enroll! The class fee will be deducted from the credit in your account for the 6 classes, until you reach a ZERO balance. Lessons can only be booked from the Pay as You Go Private Lesson schedule that changes week to week, and is only available one week in advance. Cannot be used towards an 8 week session or a 4-6 month package. Same instructor, time and day are NOT guaranteed and are subject to availability. Lessons can be used at ANY of the Starfish Aquatic Club locations including outdoor seasonal locations. Special is limited to 1 per student, 2 per family. No other discounts, promotions or credits can be used in combination with this special. Lessons can be used until 12/31/19, or becomes a credit for the amount purchased after that date. 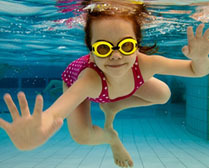 When you think of enrolling your child in swimming lessons, what comes to mind? Do you think about long summer days watching your child splash happily in the pool or cheering them on as they swim in their first race? Maybe you think about spending summers at the lake or beach and watching your child swim with confidence and ease. What you might not think about, however, is just how important it is to keep your child enrolled in swimming lessons throughout the winter. Though the short, cold days may seem like an unlikely time of year for swimming lessons, there are numerous advantages to wintertime swimming lessons. Seasonal Affective Disorder (SAD) is a form of depression that appears at the same time each year. For children, winter can be a particularly difficult time as daylight hours become shorter, normal summer-fun routines get cut back, and cold weather prevents them from enjoying time outdoors. All of these can lead children to feel symptoms of depression or unexplained fatigue. However, by keeping your child enrolled in swimming lessons throughout the winter months, they can engage in regular exercise that’s been proven to help children get better sleep, keep energy levels and appetites up, and provide other relief to these symptoms. In the winter, your child doesn’t have as many opportunities to play with friends or meet new acquaintances at places like parks, playgrounds, or picnics. However, with weekly swim lessons, your child can have a much-needed break from the confinement of the indoors while also having the chance to socialize with friends both new and old. Not only does this help thwart the loneliness that can often accompany long winter months, but it keeps you child on a reliable schedule that they can look forward to throughout the week. It improves cardiovascular health by keeping blood pressure and cholesterol levels (for all ages!) low. It’s one of the most effective exercises for kids to strengthen every muscle in their body. It helps your child burn off the calories in fat that builds up and clogs arteries. It helps prevent diabetes and childhood obesity. Perhaps one of the most important reasons to keep your child enrolled in swimming lessons throughout the winter is to ensure their safety and security around water. Unfortunately, the statistics on child drownings are very grim: an average of 350 children under the age of five drown in pools each year – a majority of which occur in June, July, and August. And while having a few months of swimming lessons here and there will no doubt help to give your child safe exposure to water, keeping them enrolled throughout the winter will give them the skills and techniques they need to stay safe in the water. The basics of swim safety teach your child to turn over and float independently in case they accidentally find themselves in deep water. As the foundation of toddler and kids swimming lessons, instructors will help your child build upon these skills so they feel comfortable and confident while swimming in any body of water – from the bathtub to the ocean. After a winter of swimming lessons, you can have peace of mind come summer when pools open, vacations call, and your child longs to get swimming! As you can see, there are several key benefits of keeping your child enrolled in swimming lessons throughout the winter. Sign your child up for swimming lessons at Starfish Aquatic Club, today! There have been a lot of changes for Starfish Aquatic Club over the past year since July 2016! We have seen 4 new locations added to our company: Randolph – LA Fitness (July 2016); Piscataway – LA Fitness (September 2016); West Orange – LA Fitness (January 2017) and Clark – LA Fitness (April 2017), with two additional locations possibly being added in 2018. The administrative staff have been working very hard to accommodate the needs of the families, students, instructors, and locations alike, and are making changes that we feel will benefit the company as a whole. So coming this Fall 2 Session – we are making some BIG changes!! Length of our sessions – You will see our sessions have now changed from 6 to 8 weeks in length starting the Fall 2 Session, as well continuing our 4 and 6 month packages. Our Summer 1 and Summer 2 Sessions will still remain at 4 weeks to accommodate for vacations for families, but there will be the option to do BOTH sessions. Fee structure changes – You will notice that our fees have changed, although they LOOK like they have increased, they actually have not. Instead of adding tax to your fees once you have enrolled, the fees are posted with the taxes included and that is the amount you can expect to pay. Nothing more. Payment options – Yes our fees have changed from 6 weeks to 8 weeks, but the breakdown is still the same per lesson. And we have now added MONTHLY payments for the 8 week sessions, meaning you can break down your payments into two payments around the 20th of the month. The 4 and 6 month packages will still have monthly payments for the 10th of the month. MAKEUPS!! – Yes that is correct!! We will have ONE makeup included in the 8 week sessions for PRIVATE LESSONS ONLY! For the 4 and 6 month packages, we have added an ADDITIONAL makeup for each package: (2) makeups for the 4 month package; and (3) makeups for the 6 month package. There will not be any makeups for the Summer 1 or Summer 2 Sessions unless both sessions are enrolled for. More about makeups – All makeups will have to be completed within 2 weeks from the missed class, so if you miss a class on the last day of the session, you will have two weeks to complete the makeup from that date. Scheduled days off – The 8 week session for the Fall 2 Session will include Halloween, and Wednesday-Sunday of Thanksgiving weekend as holidays (no lessons held), but you will still get 8 lessons total by ending in December. We really hope that these changes will help to accommodate all of our families more and give our students some more flexibility with payments and scheduling! Fall and Winter Swimming – is it safe for my child? Here are some really important tips about why it is important to keep your student in lessons throughout the fall and winter months. When the summer months leave, and the temperatures start dropping, people will often put their child’s swimming lessons on hold until it gets warmer. However, we’re here to give you some inside tips and tricks of the trade, hopefully enticing you to keep those kids enrolled in swimming lessons year round! It’s important to remember that swimming is a life skill that should be taught to all children. Taking extended seasonal breaks can set a child back, and in today’s world of available equipment it is actually unnecessary. In fact, a key factor of how children (and adults!) learn is through repetition. Breaking the pattern of repetition may have them repeating levels that they previously passed, or losing skills or confidence. So you’ve made the decision to brave the elements with your child to keep them in a progressive swimming program? There are actually some added benefits to doing so. Once the late spring rolls around, everyone and their playgroup is registering for swimming lessons. At Starfish Aquatic Club our enrollment increases by over 50% during these months. The aquatic instruction world is usually a younger generation, many of whom are high school students, or 20-somethings. College students may be returning to teach evening swim lessons for more money, or the stay-at-home mom may come back to teaching daytime lessons while her children are in preschool. That’s the benefit of enrolling in group swimming lessons: the diversity of the instructors. You may find that your child really clicks with a particular instructor that you may not have had the opportunity to work with during the summertime. If you’re only interested in doing private lessons or small group lessons, our hours are typically easier to schedule because of an emptier pool and less daytime youth programming. During the busy summer months, the influx of people starts to put a strain on the pool. The filtration systems work double-time, trying to keep up with the additional bather numbers. Since chlorine is used as a chemical to clean the water, the more people that get in the pool, the more chlorine (or other cleaning agent) must be added. That means that the water holds more organic and inorganic substances. Pool chemicals are all strictly monitored through certified personnel as well as the Health Department, keeping them at acceptable and healthy levels. However, you may notice that your local pool simply appears a bit dirtier, and possibly slightly cloudy during the summer months. Many pools are drained down in either the fall, or early spring, as an annual maintenance, and other filtration maintenance is done annually as well, leaving the pool sparkly clean and the water refreshing. Aquatic staff (lifeguards, instructors, pool assistants) are usually the ones in charge of basic pool and deck maintenance, such as vacuuming the pool, sweeping and hosing the pool deck, etc. The slower, less programmed winter months will leave the staff with more time to complete these tasks, making the aquatic center a cleaner environment in many (and most) cases. MYTH: My student will get a cold or ear infections from the outside cold air after their lessons. FACT: Colds and ear infections are caused by germs and not from being wet during the winter. If colds and ear infections were caused by getting our heads wet, taking baths and showers would not happen once the colder months start. If having a wet head is a concern, make sure to bring warm clothing, hats, hoods, and completely dry your students hair after their lessons. MYTH: It’s cold outside, so we won’t be swimming. An indoor water park resort. These family-friendly resorts are based on having everyone swim and play in large, heated indoor pools with waterslides, which are very enticing for kids of all ages (regardless of swim ability). Holiday break, winter break, spring break, or visiting family and friends in a tropical locale could definitely mean an opportunity for heading into a pool or the ocean. MYTH: Since we only go swimming where there are lifeguards, if anything happens someone will be able to help. FACT: Even though lifeguards are specially trained, it can still be difficult to spot someone in distress and react in time. That’s why it’s important for parents and other swimmers to be able to recognize the signs of drowning and what to do if someone needs help while swimming – and why you need water safety tips in winter, too. Instructors incorporate water safety skills during each lesson. These skills include understanding what role lifeguards play, how to act appropriately in and around water, what to do if kids are having trouble swimming or if they see someone else in trouble, and lifesaving techniques. And, just like any other important lesson, water safety is one that bears repeating, over and over again, so it’s second nature. MYTH: My baby isn’t even walking yet, so I don’t need to worry about water safety. FACT: Babies are masters at moving around deftly (and sometimes silently) whether they are walking or not, and they’re also very curious and inquisitive little beings who want to learn and investigate everything they see. Sometimes, that includes bodies of water. By teaching your little one how to swim at a very young age (yes, your baby can start taking swimming lessons before age 1! ), you’ll be giving her the tools she needs should an accident happen in water…because seconds count. MYTH: I don’t let my child go swimming without me, so we’re OK. FACT: Accidents can happen near ANY body of water, whether or not you are nearby. Frozen ponds, backyard pools that are covered, other bodies of water that children may be around during the winter that may be frozen over can be hazards that children need to know how to be safe around. Hopefully we’ve convinced you to keep your child in swimming lessons year round. A major concern for many parents though is the weather. If you’re swimming at an outdoor facility that stays open for year round programming, know that there are some products available on the market today that will keep your child protected from the elements. All the pools that Starfish Aquatic Club use are heated to over 82 degrees, and air temperatures are 85 degrees or more. This environment is warmer than it will be outside, and will be a safe and enjoyable place to be as it gets colder outside. Keeping children physically active in the fall and winter months will increase endorphins, boost immune systems, increase mood, help with structure and consistency with sleep schedules and eating schedules, and will give them an indoor activity to look forward to during the colder months. We adore this Konfidence. It is 1mm thick, and perfect for those children that chill easily during swim lessons, either indoors or outdoors. It’s flexible, and doesn’t allow for much movement restriction or extra buoyancy. It’s a bit thicker, and warmer than your typical “rash guard” type swim shirt. As a bonus, neoprene lasts much longer when exposed to chlorine, as opposed to lycra, so it will hold up much longer and won’t get stretched out, or start to break down and get thinner. UV shirts, or rash guards, are typically made out of lycra, and will help keep the sun off your child, and keep them warmer during the chilly time in the pool. These Konfidence would be a wonderful option for your baby, toddler, or preschooler who struggles with remaining warm during swimming lessons. Or, if they don’t enjoy the full suit option, just a UV shirt is available, which will also trap in their body heat more. You have probably noticed by now that most of our staff are now wearing staff issued rash guards to not only make them identifiable as our instructors, but to help keep them warm as the fall and winter months approach. You may want to consider some similar options for your student. Wet-suits are made out of neoprene. They serve two functions, 100% UV protection as well as keeping the person wearing them warm. These Konfidence are a favorite pick, because of the vibrant colors, and the made-for-children style. The important part of a body to keep warm is the chest/shoulder/arms area, and this shorty-style wetsuit does just that. The short legs and sleeves allow for better movement in the water, which is vital for children. It’s easy to zip on and off, and perfect for a chilly day on the beach, or in the pool. Note: Neoprene is a more buoyant material, so sometimes it allows children the ability to float easier. Making sure they periodically experience the water sans-wetsuit is important. The roll & go babychanger is a genius product because public changing tables can be downright icky – especially in a damp aquatic environment. The one side will be clean and sanitary for your baby, while the other side won’t slip or slide, because of the grippers, while you’re in the locker room. A reusable swim diaper is a much more economical choice if you’re going to be in the water with your baby or toddler regularly. Many public pools also require “plastic pants” to be used overtop of disposable swim diapers as well. Whatever choice you make, we hope that it involves aquatic training and education with your child as much as possible. We’ll see you at the pool! Sarasota, Fla., March 25, 2016—April is Adult Learn-to-Swim month. According to the CDC, about 10 people drown every day in the United States—the majority of them adults or young adults. 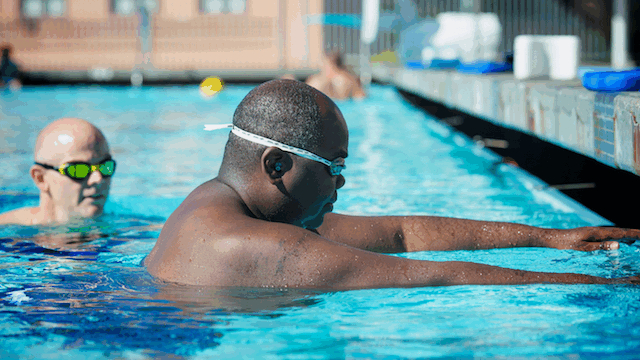 The Swimming Saves Lives Foundation, U.S. Masters Swimming’s charitable arm, continues its annual campaign to directly reduce adult drowning by training and certifying adult learn-to-swim instructors and by providing grants for adult swim lessons. Since 2014 the foundation has awarded more than $205,000 in grants to program partners offering adult swim lessons in communities across the country, including $90,000 in 2016 to 44 partners. The USMS Adult Learn-to-Swim Instructor Certification Program, launched in 2015, will visit 25 cities this year. To date, 504 instructors have been certified, with 425 more anticipated by the end of 2016. U.S. Masters Swimming encourages all of its nationwide programs and members to participate in April is Adult Learn-to-Swim Month by hosting ALTS classes in their communities and by donating to the Swimming Saves Lives Foundation, which is funded by voluntary contributions from the more than 60,000 USMS members. Governors from 11 states have issued proclamations declaring April Adult Learn-to-Swim Month this year, including the governors of Michigan, North Carolina, Maryland, and New Mexico. Anyone interested in finding or offering adult learn-to-swim lessons is encouraged to visit usms.org/learntoswim. 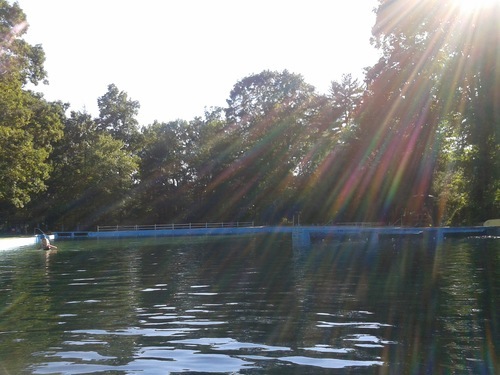 Starting June 2016, Starfish Aquatic Club will be offering lessons at the Swim and Sport Club in Flanders, NJ – an outdoor club with membership options for the summer. Starfish Aquatic Club clients do not have to be members to take lessons at this facility, but it is encouraged to get the benefits of the club. We are excited to be adding this location to our year round locations and our summer location at Idlewild, which will be celebrating its 4th summer! Starfish Aquatic Club has changed our process for enrollment! Why? Because we listened to YOUR feedback, have restructured our managing team, and are focusing on our families first!! This means…we are promoting the option for 4-6 month packages (quickly becoming our MOST POPULAR option for lessons). 4-6 month packages include makeups, discounts, and the highest probability to have your instructor the entire time you take lessons with us. This means…Our staff are serving YOU. Instead of you having to search for your lessons in our customer portal, simply REQUEST your lessons and WE do the work! This means…No more getting closed out of your time slot because another family booked it before you, getting your first pick of lessons, getting your instructor of preference, less time searching for lessons online giving you more time with your families and less time being online. This means…you will NOT be able to view the schedule for the next session of lessons until we have put in the students that have requested their lessons (i.e. a week before the session starts). So we ENCOURAGE YOU to request your lessons so we can best serve YOU. This means...the only lessons that will be available in the portal to enroll for lessons will be the spots available IN BETWEEN the already booked students (i.e. 4:40-5 if a student has already been booked at 4-4:20 and 4:40-5). This means…there will be LESS blocks of time available for instructors as we are trying to give them more compacted schedules. This means…you are NOT enrolling for a class in the customer portal so no need to log in and search for a class. This means…you will be working with a manager to help you enroll rather than searching. This means...your class schedule will show as a “4 Month Package” or a “6 Month Package” with a start and end date of the package, and the FULL AMOUNT of what the package will be. This means...your class schedule will NOT SHOW as “December Session”, “November Session”, etc. It is a set schedule for a period of either 4 or 6 months. This means…no possibility of NOT being enrolled for the next month of lessons since you are PRE-ENROLLED for the 4 or 6 months. This means...knowing the full amount you are paying in advance, with the option of being billed once a month or in full. This means...we can enroll siblings, friends or cousins of the same age or ability (i.e. twins, a year apart in age, neighbors, etc.) at the same time with the same instructor. This means…we DROPPED OUR RATES to make a more economical approach to lessons. This means…not only do we have pre-created Semi-private lessons, we also have the OPTION TO CREATE YOUR OWN. So our management staff asks that you please give our new enrollment process a try as we feel it will only make your time at Starfish Aquatic Club, a better experience.